As well as the Skypath news yesterday, on Wednesday the results of the consultation on what to do with the Takapuna carpark were announced. In an independent survey conducted by Colmar Brunton, 69% of people preferred one of the two development proposals. In the Auckland Council-run consultation, 55% of people who responded were in support. 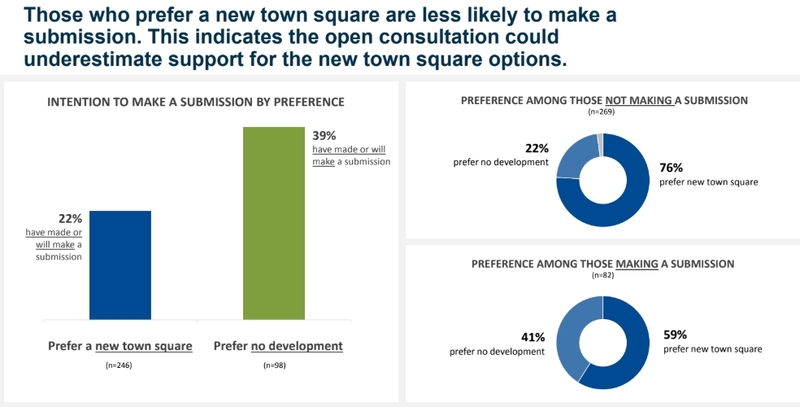 Earlier engagement with the community identified the two preferred sites for the town square. 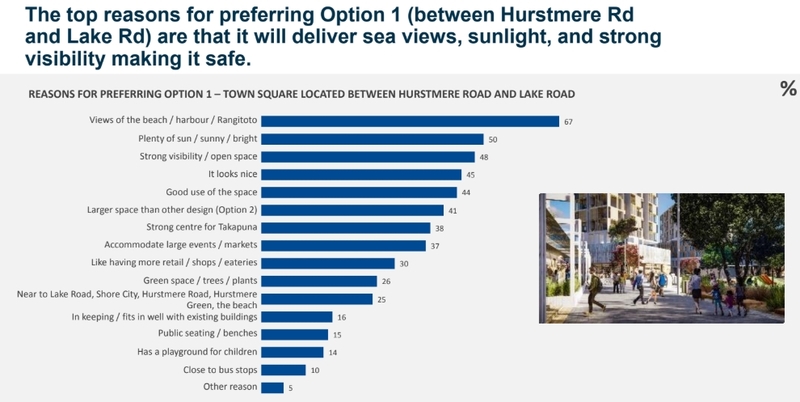 A site between Hurstmere and Lake roads came out as the preferred location for this new public space in both the consultation (46% of responses) and the independent survey (40%). North Shore Ward Councillor and Planning Committee Chair Chris Darby says: “The community has given us a clear steer that they want to see their village improved from a car park, to a safe and well-designed public space for people to love, with places to eat, shop, live, work and spend time. It’s good to hear the development will now proceed. It’s also interesting that a separate independent survey was carried out, but in doing so it’s highlighted some fascinating results. Next we have one of the more fascinating outcomes, showing preferences by age. As you can see, there’s a clear generational divide with those under 55 overwhelmingly voted for one of the development options while those in the 55-64 bracket were the most strongly opposed. Even the over 65 age-group voted for development if you combine the option 1 and 2 outcomes. Why is it that just this one age group are so fearful of change? By comparison, those preferring option 2 was due to how it looked, notable as I don’t think the graphics were really that different between the options. What is quite fascinating are the reasons people voted against any change. Much of the focus from those pushing the no change line was that the carpark should be redeveloped into one huge town square but it seems the real reason was just that they wanted more parking (they want this and the new parking building). It’s also worth noting that the local business association were supportive of the development options when these associations are usually the ones that push for carparking the most. 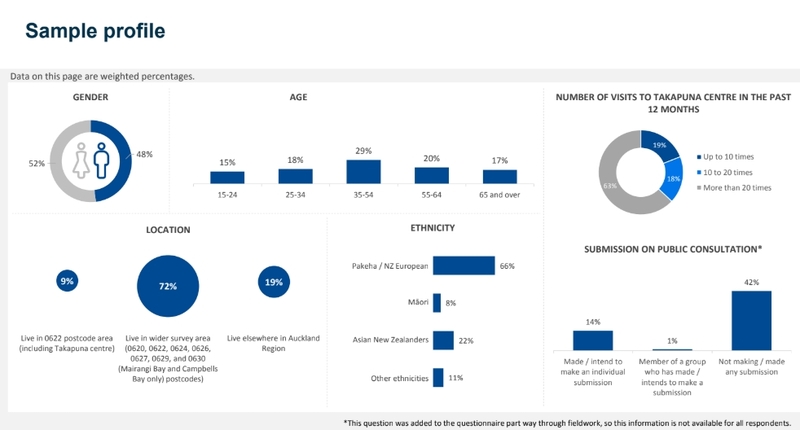 Finally for Colmar Brunton, the demographic breakdown of those surveyed. In addition to the Colmar Brunton survey, Panuku provided a presentation on the results of the consultation. The red oval and rectangle are part of the presentation. You can see that more actually selected option 1 than do nothing. And this table shows a breakdown of where the submissions came from. 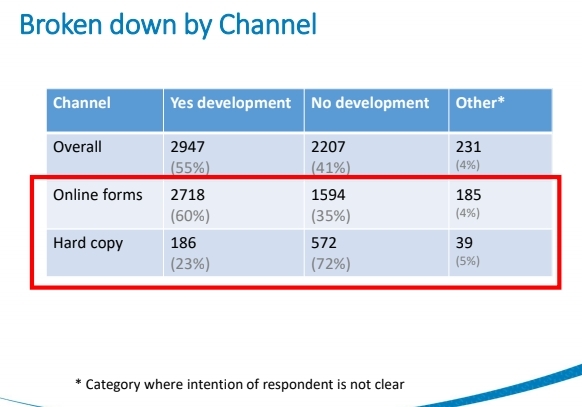 What stands out here is that vast majority of those submitting via a hard copy opposed change but the results were the opposite for online forms which made up the bulk of the submissions. All up some great numbers and even better that Panuku will push on with developing Takapuna. Great to see a survey of community opinion being carried out. This is a REAL consultation since it captures a representative cross-section of society, not just those motivated/angry enough to opt-in to the submission process. Most opt-in surveys suffer from selection bias of some form. Even if the bias is simply time-rich opt in versus time-poor opt-out. The problem is people from all over Auckland could participate, when it should only have been people from Takapuna. There’s enough cheap and nasty apartments going up in Takapuna without another lot. Do you mean that the council *does* think logically? They probably couldn’t afford the $50m of civil works and the foregone income from selling the land that your plan would require. It’s entirely appropriate to ask the whole region what they want for a regional centre and works funded regionally. Sailor Boy calls Takapuna a ‘regional centre’. Of which region is Takapuna the centre? We are talking about Takapuna. Takapuna is not a regional centre. Where is the evidence that the development on the Takapuna Car park site will be funded regionally? The Business – Metropolitan Centre Zone applies to centres located in different sub- regional catchments of Auckland. These centres are second only to the city centre in overall scale and intensity and act as focal points for community interaction and commercial growth and development and contain hubs serving high frequency transport. The zone provides for a wide range of activities including commercial, leisure, high- density residential, tourist, cultural, community and civic services. Zone provisions, in conjunction with rules in the other business zones, reinforce metropolitan centres as locations for all scales of commercial activity. These centres are identified for growth and intensification. Expansion of these centres may be appropriate depending on strategic and local environmental considerations. Yes the carpark is being funded regionally as it comes from Auckland Council budget, not the local board budget. Yes, this is a wasted opportunity, and really detracts from Takapuna. I do wish they’d focused on removing this carparking first. Or remove both. They are each equally a waste of land. Underground parking costs around $80,000 per space to build. Just how much a rates rise are you asking for? Nick R as Takapuna is not a hub, i.e. it’s not on the way to somewhere else and people have to make a point of driving in and out of Takapuna, I don’t believe that it is the right place to make into a metropolitan centre. It’s not the centre of anywhere – not even of the North Shore. In your reply you say ‘Expansion of these centres may be appropriate depending on strategic and local environmental considerations.’ and strategically and environmentally it is inappropriate for Takapuna. That is my opinion. As for the funding I was told that the proceeds from the sale of the car park will be spent on building the gasometer car park and creating the proposed laneways in the planned development which means that it is self funding. The gasometer car park is a $30 million project. How much do you think the land they are selling is worth? There’s no way it’s self-funding. The gasometer carpark is a very expensive way to provide extra, unnecessary carparks. For years now, AT should have been pricing the existing carparking to capture the real costs of providing it and the damage it causes. Even just pricing it as per the private carparks nearby would have reduced demand. Why do you think the carparks are unnecessary Heidi? Takapuna fills up, taka away the central carpark and you have to replace it with something else. Good urban design means people can walk, cycle and take public transport to everything they need because it is pleasant and not too far away. Roads and carparks are needed if we have cars, but excessive space given to them, and priority given to driving, spread things apart too much and make walking, cycling and taking public transport unpleasant. Council and Auckland Transport both list reduction of carparking as important steps to creating a more compact city, where things are more accessible due to their proximity. Auckland Transport should be pricing parking fully – at present they’re not matching the market price, and indeed are driving it down. No-one is charging the full cost of parking, so people who don’t park are subsidising people who do. The excessive sprawl that AT-Grade carparks cause, and the excessive price of multi-storey carparks mean that neither is wise. If people parking pay fully for the privilege, then fewer people will be wanting to park, the carpark space can be put to better uses, and a thriving economy and lifestyle can develop. The myth that carparking is what drives a local economy needs to be left behind. I’ve just had to return a copy of “Parking Management for Smart Growth” to the library system (I had to pay $5.20 for the interloan!) but if I get another copy to look at some time, I’ll quote to you examples of similar demographic and economic centres in the same city which approached the parking question in different ways. It was the ones where they priced and reduced parking that led to better economic outcomes and more livable areas. Yet in the one where parking was not reduced or priced was where people believed there wasn’t enough parking. Providing parking is the strongest determinant of people needing more parking. And not via economic vitality. It’s via car dependency – why do anything other than drive when walking or cycling or being stuck in a bus due to traffic is unpleasant? Removing the central carpark of Takapuna and providing apartments for residents means the economy will be better off in Takapuna, and the place will be more livable. “Replacing” those carparks with nearly twice as many carparks at the gasometer site at great cost to the ratepayer will hurt the economy everywhere and put more cars on the road while losing the opportunity to create some traffic evaporation. The car-parking at the gasometer site should not be funded from the sale of Takapuna land. Nowhere else in Auckland are people being asked to sell off community land to pay for transport infrastructure, be it bus, rail, cycling or car-parking. AT alone is responsible for providing transport infrastructure. I should add that I agree with above comments that that we shouldn’t even building a dedicated car-parking building there, but a proper rapid transit station instead. Sorry forget to add the really important one for those, beyond driving, a state we all have to comfront at some time, is the availability, and quality of public transport. Housing may well be cheap in the sticks but that is not a good option if there are no viable options to get out and about. Justifying the provision of car parking on the needs of the elderly is just b.s. What is far more important is improving mobility options for those beyond driving and here facilitating car based mobility is just totally counter productive. What is good for car based mobility seriously impedes both footpath based mobility and public transport which is what is left for those beyond driving. If you only want to consider the opinion of people in Takapuna, does the Colmar Brunton poll give you the data you wanted? Many of the people who live in Takapuna and therefore should have been having a vote were missed in the council’s delivery of the how to vote info. Anyone could vote no matter where they lived. I agree with Master Chief that council doesn’t think logically as they should be planning ahead for an off-street bus-station and a much bigger public space. I definitely agree the public transport needs should be key to the decision-making here. Ann, do you have an example of an off-street bus station that you think should be the right sort of thing for Takapuna? When I catch buses to/from Takapuna the existing bus stops have worked well for me – what didn’t work was lack of pedestrian crossings up in the northern part of Takapuna. I’m just trying to imagine an off-street bus station that doesn’t create sprawl and severance; in theory I guess it could work but the only ones I can think of don’t. The bus station in Takapuna is problematic, as there is not enough room for all the buses to stop kerbside at times. Also the buses have to navigate a busy street and rely on pedestrians to give way for them to turn. It will soon become busier when Hurstmere Road which runs thru the shopping strip becomes one-way. That’s why I think it would be sensible to create a station for public transport as part of this development. If there isn’t enough room kerbside then give them more kerb. Off street bus stations usually aren’t very good for bus passengers or bus operations, they end up being slow to get in and out of with time consuming detours. If the buses have to wait for pedestrians now, how would driving in and out of a station be any different. I also wonder where such a large station would go if not on the street, they take up a heap of room. The new bus station at Manukau is off street, so is the one in New Lynn. The best place for Takapuna’s bus station would be below the present car park, which with foresight could make provision for a future rail station there as well. For those who are debating the funding source for the gasometer site and Panuku’s developments associated with development of car park site, the last I heard was that these things would be funded from the proceeds of the sale of the Anzac Street car park, but previous Chris Darby said that the fund realised from the sale of Takapuna Car Park would be funding the development of Northcote Shopping Centre. I don’t know where the evidence is for Auckland Region to be funding the Takapuna development, which is what Nick R says is the source of the funding. Indeed, at the one at Manukau is a big diversion for all buses and bus users, and it takes up 14,000 square metres of land… that’s literally twice the size of the Takapuna carpark. New Lynn bus station isn’t off street, it is on Totara Ave. It takes up a block of Torara Ave 250m long. That’s the same as Lake Road between Como and Huron streets. So maybe that is the idea, make the central part of lake road buses only like they have in New Lynn. Ann, saying that the bus station should go under the carpark without any discussion of cost is just bonkers. Do you really want your rates bill to double to pay for a two or three hundred million dollar underground bus station? Especially when it would mean slower and less convenient buses that the status quo. Ann, underground carparks cost much more per park than at-grade carparks. AT currently controls about 2300 parking spaces in Takapuna. The higher priced private carparks are not full, even at peak time. So Takapuna doesn’t need all the carparks it has, it just needs them to be priced and managed properly. Over time, as Auckland’s car mode share declines, Council needs to and intends to incrementally replace car parks with better development. Here’s an opportunity, but instead they’re going against the stated strategy by increasing the number of car parks. This is undemocratic – 9000 people submitted on the parking strategy! – and will contribute to traffic congestion and climate change, ill health and social inequity. Why do people think they have a right to car parks when we need housing in that space? Why do people think they have a right to overrule the city’s low carbon strategic action plan, and the city’s parking strategy just because they’re used to having a carpark in a particular place? All of you telling me under-grounding the car parking is not affordable will be able to explain council’s logic in creating an underground car park in Northcote centre’s development just a few miles away. I am aware that under-ground parking costs more. No ‘public land’ is being sold there either. 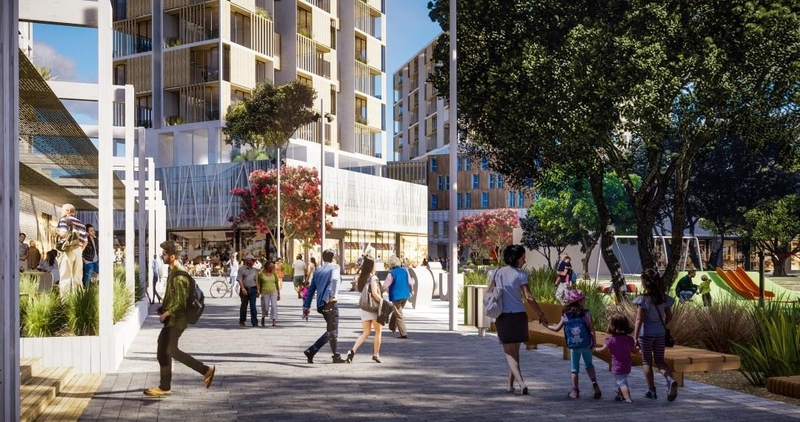 From what we have seen so far Panuku will sell the car-park to a developer without there being enough thought given to public transport, which should be central to the plan for Takapuna. Most of you are pushing walking and cycling as an alternative to driving a car, but you don’t seem to realise that there will be more people who can’t walk a distance or ride a bike. With an aging population public transport needs to pay particular attention to people who are not able to walk very far, or are in a wheelchair, or can’t ride a bike and might HAVE to use a car or be driven. In reply to Ann, an ageing population means that each year there is an increasing portion of our population that is beyond driving. For those people there are massive benifits in centrality. As their post driving mobility declines, centrality gives more facilities within walking range, followed by mobility scooter range, zimmer frame range and eventually affordable taxi range. Gareth Morgan’s idea of penalising retirees, by a property tax, for staying central, was economic nonsense in that it would both deprive those beyond driving of income, and at the same time increase their mobility costs. There is suppressed demand for travel in the elderly. Many are dependent on other people driving them places, which isn’t freedom. While the obvious one in a car-dependent mindset is that elderly people won’t drive if it’s too difficult to find a close park, the other realities are that they need better pedestrian amenity, particularly to and from public transport. As the current group of active supergold card users age, I think we’ll be seeing quite a bit of vocal demand for better pedestrian amenity and, as with the calming influence this demographic has on younger travellers in public transport, this will be a welcome voice. Driving is harder as we get older. Cities with more advanced transport networks than ours meet the needs of older residents with easy-to-use public transport and good pedestrian amenity. Remember too, that the cities where public transport and active mode infrastructure are well-developed and well-patronised, are also the cities where driving is superior. So to meet the needs of those who are really too unable to walk to public transport, we are still better supporting public transport and good pedestrian amenity first, as the best way to get as many people away from driving as possible. Heidi, I agree with what you are saying here “So to meet the needs of those who are really too unable to walk to public transport, we are still better supporting public transport and good pedestrian amenity first, as the best way to get as many people away from driving as possible.” But Auckland Council is not catering for the elderly in the ways you suggest. While old people wait forever for a frequent, reliable bus service within their walking distance, Auckland Council is pouring money into cycle lanes and Skypath. Could be a way to get the votes of the younger generation. To understand the rationale behind investing in cycleways, though, you need to look at the business cases. For each dollar spent, there are many dollars saved. The benefits are so huge – for our health budget, for the local natural environment, for social wellbeing, for better economic opportunities for people who don’t have cars, for reducing our carbon emissions. So there’s no argument there that it’s money ill spent – we’re getting it all back, several times over. Which is opposite to investing in carparks, as an example, which is a huge cost per park, and all we get in return is the negatives associated with the induced traffic and sprawl it causes. Have a read of Auckland Transport’s Roads and Streets Framework, Ann. It’s inspiring. The clear direction is to make a transformational change in Auckland to benefit the elderly, the disabled, children, etc. The will is there. The research is there. The public transport people in AT have also done an amazing job of improving the network, despite what the media are saying in their beat-ups. -there would be a team dedicated to improving wayfinding, pedestrian amenity and walkability between bus stops to make all transfers easy and pleasant. -the Roads and Streets Framework would genuinely be being used to ensure every road project or streetscape upgrade would put people before traffic flow. The best thing we can do is support the people-friendly progress and make it clear that we are not dependent on our cars and don’t support the car dependent mindset. Interesting only 9% of survey respondents in the Colmar Brunton survey actually live in the Takapuna postcode and that 79% of all the respondents want some form of development despite the concern over a loss of the car parking. Shows how important Takapuna still is to a much wider geographic area of people that just Takapuna residents and that coming by car/where they park their car if they do doesn’t outweigh their preference to see Takapuna improved. Would be interesting to see geographically where the bulk of the opposition/do-nothing-for-now comes from and how ironic if it were from Takapuna locals: the thing stopping Takapuna improving are the people of Takapuna! Takapuna has the potential to be the best town centre in Auckland, it has so much going for it that it’s crazy it has taken so long to develop it properly. Absolutely! And hearing that this development is proceeding actually makes me think I want to move there soon. Those aren’t going to be cheap apartments they build on the carpark. Especially once LR gets across to the shore. This is something that a lot of naysayers seem to be guilty of – Not looking forward far enough. LR will get to the shore eventually (I know, not soon enough). When it does, providing it services Takapuna intelligently, it will create a fantastic little village. Kinda like Gold Coast, but with a soul. Building more car parks in the middle of the village is unintelligent and wasteful. I’m not saying that carparks aren’t required at the moment (and for another decade or two), but peripheral parking would be the best decision here and in the future. If you can’t walk a 100m, you should have a mobility scooter. Really interesting survey results. Confirms for me that there needs to be a huge public education about parking and how the city needs to reduce its parking at each opportunity, as we move to a more compact city. Heidi, you may have seen the locally developed proposal for a 600 space car park under a proposed town square. At every meeting I went to regarding the change proposals it was just a given that there would be more car parking – “future proofed” as they called it. There was no thought that these proposed structures should break even financially, but rather that they were some sort of public entitlement. There still seems to be a real disconnect for many people in that they believe that NZ will solve its ghg problem by reducing cOW herds and someone else driving electric cars. For me this struggle over car parking in Takapuna (and Auckland) has just begun. I am hoping that Matt will run my post regarding AT selling all their off-street parking buildings. This matter will gain traction. Publicly Minister Shaw is very critical of AT regarding vehicle fuel emissions. My understanding is that the Zero Carbon Act will have five year targets with the strong expectation they will be achieved. That will be an interesting conversation given that AT is so reliant on government funding. I forgot to mention that we probably don’t need a public education plan around parking, but that AT just needs to charge to ensure that their car parks are commercially viable as their Parking Strategy provides. That of course would mean that parking prices are set at a level to ensure that happens. It is my estimate that AT would have to price daily parking in the new Takapuna building at $18 to make it commercially viable. My bet is that within 6 months of it opening prices will be at $7 per day. I can see that I will become the local boards best friend as I explore issues with them. At $18 to be commercially viable, you’d still have to add on the contribution that each carpark makes (through the traffic it induces and the sprawl caused by the space it occupies) to ghg emissions, poor air quality, severance, unhealthy streetscapes, lower activity levels, lower access levels, lower economic health, public health costs. I wonder what the figure comes to when all the externalities are included? Yes, Takapuna needs development of this space but the consultation presented three very poor options, two of which involved selling off most of the available land to private interests. There is no need to shrink the public space to the extent that was proposed and to me enhancing and increasing the size of the planned town square has to be the next step. As examples in Auckland show, mainly Aotea square, public squares which are too large can be very hard to make vibrant and activated. Smaller squares have generally shown to be more successful eg. Freyberg Square, Takutai Square, Hurstmere Green. Urban designers used to do precedent studies – draw to scale the outline of the proposed public space on an aerial map of other well known public spaces from around the world. People always seem to remember incorrectly how large or small other spaces they reference are because there are so many factors at play in why they think a space works well (or doesn’t). At workshops I’d often get suggestions like – “this should be the same size as Piazza San Marco (despite that space being 1.2 ha and getting 20 million visitors a year) or Plaza Mayor in Madrid (also around 1.2 ha and serving a city of over 6million)”. You would quickly get down to talking about truly comparable spaces after looking at precedent studies. I don’t see them much anymore, if at all – have we moved on from them as a tool? I’d argue that the Takapuna consultation responses would suggest not. The scale of Takutai Sq is too small for Takapuna, because it would be the only local urban square. Takutai works well because it is near a transit station and because there are other nearby urban spaces like Freyberg, Aotea, St Patricks squar, the viaduct and soon Linear Park. 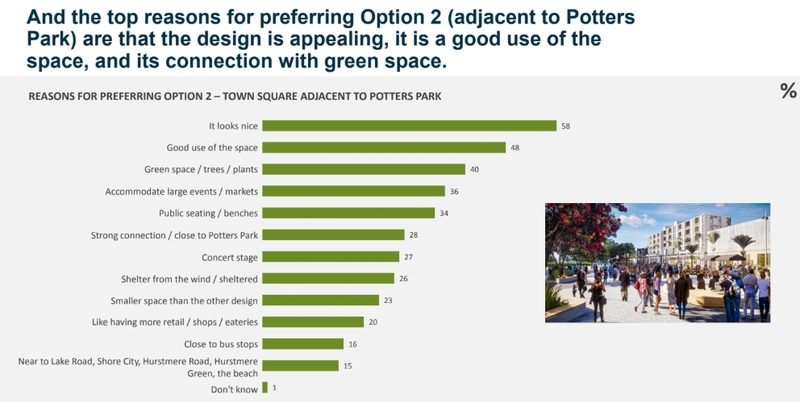 The Takapuna town square will be the largest urban space in that area so let’s be careful to size it properly to be able to accommodate multiple civic functions. It could be something to really look forward to. Erm no, Takapuna town square will be within spitting distance of the rose gardens, the new Hurstmere green, the revamped Hurstmere Street, the beachfront park, the new parklet by the holiday park, and thats before you could auburn reserve, the park along the front of Barrys Creek or the park at lake pupuke. Thats have a dozen urban spaces right next to each other. The risk is very much having too many empty, inactive spaces, not the other way around. Yes it needs to be sized properly, but that means not making it too big. Go try centre place in Hamilton, or even Aotea Square in Auckland central to experience a public space that is far too large for the context. Out of curiosity I looked around on Aotea Square a while ago, which confirmed to me that it’s not just about size. – Looking at Queen Street, there’s no shortage of people nearby. – Part of the square is grassy area and is functioning more like a park. In sunny weather it is actually not that empty. – Lack of activation. Unless you’re a fan of blank walls, there’s not much to see around the square. The only other things on the square is the back of 4 restaurants in the Civic building, and that’s it. – The other thing making it much quieter than expected is that for pedestrians it’s essentially a cul-de-sac. The other side is hermetically sealed off by Mayoral Drive and the surrounding parking lots, and the Town Hall (over 100 m long) further isolates it from Queen Street. Simple geometry at work — there’s no logical reason why anyone would just happen to walk through that square. So apart from the size, perhaps even more important is what’s on the edge of that open space. I assume something more interesting than blank walls. And also, no roadways between the square and the buildings. Good point, yes it’s not just size, but the combination of size, people and activity. Aotea is “dead” on two sides with the blank and inactive Aotea Centre, and the park section (at least most of the year it is pretty dead). This may change soon as the are building out from the Aotea Centre and building a lot of apartments and a new theatre space on the western end of the precinct. Takapuna carpark made into a square would be the same but worse. Blank on all sides, no activity in the middle, no things for people to go to, from or in. Well, it would be just like a big carpark with no cars in it. ATEED run wonderful events in Aotea Square! Ice skating is popular. 900 carparks are quequed for on those days. Square was overflowing for teachers strike. Good spot for public demonstrations, certainly. Not being a through-route is a big problem as noted. But the layout doesn’t lend itself to improvement. The pattern language pattern about creating “positive” space (ie enclosed space instead of left-over space) has been ignored here. So has the pattern of tiny spaces looking onto small spaces looking onto larger spaces looking onto large spaces. The areas around the grassy levels are left-over ‘negative’ spaces. Blank facades could normally be improved by allowing stalls or activities along them, so there is interest at many spaces along the edges. Instead, that leftover space between the grass and the town hall wouldn’t be improved by a line of stalls, because that would just leave a narrow strip. The glass facades on the north west side of the grassy levels: https://www.google.com/maps/@-36.8521822,174.7627313,3a,75y,339.69h,100.18t/data=!3m8!1e1!3m6!1sAF1QipP93PJ_s7TOeWaeW1e4PTff-z7aSEFu5Y9fo-Qb!2e10!3e11!6shttps:%2F%2Flh5.googleusercontent.com%2Fp%2FAF1QipP93PJ_s7TOeWaeW1e4PTff-z7aSEFu5Y9fo-Qb%3Dw203-h100-k-no-pi-0-ya194.829-ro0-fo100!7i8704!8i4352 probably can’t be covered by a line of stalls. The seats in the foreground of that view have been placed ignoring the basic principles of having something solid behind, so you feel protected as you look onto a bigger space. And why didn’t they have one bigger grassy area on which you could have a proper ball game, surrounded by some grass and tree areas in which to picnic? I’d imagine and hope Panuku designers use Pattern Language or similar good urban design principles, so hopefully Takapuna will get something far better than Aotea. How will you be able to see the sea? Are they going to cut down trees as part of the town square? Takapuna town centre is currently just a sad, terribly lost opportunity that has just got sadder as each year passes. It is blessed with one of the most stunning locations in the world for a suburban centre, yet has totally succumb to moving and parking cars. It is a citywide, even national, asset that is far too valuable to be left in the charge of last centuries locals. People complaining that land shouldn’t be sold to private companies seem to forget this land is mostly occupied by private property, i.e cars. I wonder council in there consultation process should incorporate some kind of street survey with prize draw/little gift to make their results more representative. Those who were opposed to any development on this site referred to all the private development going on in Takapuna already and they didn’t seem to be afraid of change at all. And this article is not correct in saying that these people actually wanted more parking as I understood that they thought the bus station would be under ground as well as rail in the future. As a matter of fact I thought the local board were in favour of some parking on this site. If you take their comments at face value only and refuse to accept that speech always has subtext, then this would be an entirely reasonable interpretation of the primary opponents’ views. I think that you are right on the money. One of the strongest advocates against change is involved in the Devonport Heritage Group that seems opposed to much progress. Myles is that right? And there’s not going to be any carparks for the businesses or apartments, so how will people get on for deliveries and things? Believe it or not Ann most couples own at least one car. The apartments with 3 bedrooms will two parks. Most couples own zero cars actually. There are fewer than 1 billion cars globally. Believe it or not, most human beings are less thick than pig sh*t: they can accurately observe the ability of a dwelling to store cars and make an informed decision on whether to purchase or rent the dwelling as a result. People also make decisions about their housing choice based on things like the number of bedrooms, number of bathrooms, and number of kitchen cabinets. Some of us don’t want to waste $100,000 paying for space to store unnecessary appliances. What’s the rest of the world got to do with families in NZ having more than one car, when I was a teenager we had 4 cars, that’s a straw man argrument if ever there was one. The fact that there are no car parks for apartment residents, might put buyers off buying the apartments, unless they are cheap one-bedroom boxes that people with no car might afford to buy. in their house rather car storage. Why not give them the choice? It is increasingly common to see garages repurposed into living space in existing houses. Or maybe people with a vision for a future? A future where car-sharing and self-driving vehicles will be the most convenient, cheapest and safest form of transport. Carparks will become a relic of the past. Yes, Chris. It’s not even a future thing. If you don’t use a car for your commute, it’s usually better financially to not have the car, especially if it involves a costly garage. The costs of carshare and rentals – if it’s not for your main transport needs – are low enough to mean the financial decision to not have a car and carpark is a sound one. If apartments are required to have one or two carparks each just because some people can’t imagine people not needing that, and the owners have to pay for them anyway, that’s both an unfair cost to people not wanting the carparks, and it’s a financial nudge for people to have a car since they’ve already paid for the carpark. And once you’ve got the car, it often makes better financial sense to drive instead of taking the bus… vicious circle to more cars on the road and more car dependency. Anyone not understanding this has a duty to learn more – the traffic induced by these carparks is causing ill health for our children. You should go to literally any other country on earth if you can’t see how deliveries work without private car parks. Or perhaps go and see how the 10,000 apartments and thousands of businesses in the city centre do it. I’m sure the developers will build whatever gives them the best financial return. I hope the building will be of a good standard. A design competition might bring out some exciting architecture. You do see some really funky architectural designs come out of competitions. Also when there’s a tender process, sometimes the tenders that don’t win can be really good. Too often the really eco-friendly and people-friendly designs, with gardens and clever water use designed into the whole rather than tacked on, and with less design around the car, get looked over for the winning design. Any architects care to comment on whether this is a true observation and if so, whether there’s anything more complex that the obvious in the reason? Indeed, and the best financial return comes from building the thing people want the most. They wouldn’t build apartments without carparks unless people wanted to buy apartments without carparks. Wonder where the 800 cars per week which actually arrive in Auckland park? Nth Shore’s Park’n Rides & Motorways are packed by 7.00am each weekday.Dream on! Even Retirement Villages can provide double garaging. Soviet bread shops were sold out by 8am too. Perhaps the council shouldn’t be giving away valuable services for free. Perhaps if they let people build carless homes at major transit stations there would be less demand for park and ride? Didn’t work out too well at Manukau Station did it? +1, that should be sold too. Perhaps cyclists could put their bikes on ferries & allow walkers a safe passage over Sky PATH. Using the ferry means the person would be using fossil fuels to move the bike, and having to pay a high ferry ticket price. Using Skypath means the person would be able to use their own energy, improving their health, their finances, and our health budget. So I don’t know what your point is. If you think Skypath isn’t going to be wide enough for both cycling and walking, that is a concern, and you should submit that more space is being given. Maybe motorists should use a car ferry to cross the harbour so the whole bridge can be used for buses, light rail, pedestrians and cyclists. I wonder how demand for park and ride would be if people had to pay for it? Indeed, “parking demand” is defined as the percentage occupancy under market conditions… something we rarely see. Compare the Auckland situation with Wellington which has just introduced charges for weekend prices to keep rates down (here’s a clue for you Phil) and some estimates are that it will produce extra revenue of $3 million per year. I wonder what such a move would produce in Auckland? I guess that I will find out – I feel an OIA request coming on. I meant to say that in many areas Sundays are free. Which will result in people driving to restaurants in locations with parking, it’s a nail in the coffin for Takapuna restaurants and retail. People in plenty of other parts of Auckland wouldn’t drive to restaurants anymore. People driving around looking for a park is a sign not of insufficient parking, but of insufficient pricing. For some people, the nudge to pick up the other couple on the way, or to get that exercise walking to the bus and realising how pleasant it is in company, needs only a dollar or two extra per hour. If there’s something preventing people taking the public transport, let’s talk about that: it’s probably that the traffic is holding the buses up or that the pedestrian amenity walking from the buses is too unsafe due to the traffic. In which case, building more parking will only exacerbate the traffic problems. Yip, that’s the challenge. It was like that in my area just ten years ago, but it can change. Adding parking is heading the wrong direction. Chris, the other thing is that it’ll be harder to bring down the PT fares if we continue to subsidise parking. Let’s bring ALL the costs to the table, and then see which is cheaper. Public transport has a fundamentally more efficient baseline to start from; it’s only the subsidies to driving such as all the costs taxpayers foot for health, and ratepayers’ foot for parking, that makes those PT costs work out as more expensive than driving and parking. That’s right Chris. Half-hour waits for buses means that most people have no choice but to drive, which is ridiculous in such a highly urbanised part of the city. I’d love to be able to use public transport to get to Takapuna restaurants. It’s a sign of weird pricing. You see this everywhere in Auckland. Auckland Transport has free or nearly free parking which is always full, while private operators charge something stupid like $5 per half hour, meaning their parking lots sit empty. You see this even at the beach. The AT half is full, and there’s always lots of people circling around on The Strand in vain. And the Wilson half remains empty. Maybe someone can explain me the underlying economics. Half hour waits to go to a restaurant don’t work if you also have to transfer. But if you know the timetable, or can check the app, it can work and provide a nicer night out. I’ve functioned this way for my transport for a long time. Hard if it’s a daily commute. Perfectly acceptable for nights out to restaurants. FFS we’re experiencing climate change. How nice is that meal when you’ve been contributing to the problems? Here’s how the economics work: nobody makes money renting parking. AT subsidise parking with ratepayers money. Private companies aren’t in the business of selling parking. Wilsons are land bankers who make their profit from holding land, not by renting carparks. And half their holding income comes from infringement fines. And I like to go to restaurants all over the city, I do not want to be constrained to a single area. If I can’t find a parking space then I won’t eat in Takapuna, I’ll go to Albany, the City or Ponsonby. Same with the cinema, I like the Takapuna cinema, I used to live 150m from it, my wife and I usd to go at least once per week, I no longer live in Takapuna so if I can’t park near it I’ll go to Wirau Park or Albany. Yeah well, local living has its advantages. But as long as you don’t think you have any kind of right to use fossil fuels, contribute to climate change, demand parking availability and have a road system set up for you. As long as when progressive change to other modes is happening, you don’t rally against it and complain about money being spent on them. Because your rights don’t extend that far. No because all the people in the apartments will be a massive new customer base. See that is the future, bring customers to the area as residents rather than requiring people to drive kms to get there from their suburban houses. Yes, and with those PT-friendly apartment dwellers, the PT will get better, meaning that even the suburbanites will be better served by PT to get to Takapuna. All good. How much parking is the Americas Cup funding putting in? Surely with thousands more people going to the waterfront their restaurants must require thousands of new caparks closer than 450m away? Right? Recent count shows there are more than 20 empty shops in Takapuna. Some have been vacant for more than 12 months. I wonder why the private owners of these empty commercial buildings are prepared to abandon the rental income, when under the Auckland Unitary Plan they could develop their sites quite significantly and to higher levels, which could enhance the area and attract business. Why is the council spending money on revitalising the area at the expense of public open space? In Newmarket it is a private developer who is revitalising that area and providing 2,000 car parks also, or so I heard. If development was all it needs for Takapuna to became a booming business and residential area you’d think the commercial property owners would have done it years ago. Exactly what doesn’t work commercially is an obsession with car parking. As you show. What we know does work is high quality public realm and high quality (frequent, legible, safe) public transport. Why the loudest voices are opposed to the later and delirious about the former defies logic and evidence. Happily the Council is investing in the public realm, and has just upgraded the Shore bus system, by far the best in the city. And anyone who doesn’t like congestion will need to avoid Newmarket. And St Lukes. Calling a user pays carpark a “public open space” is being just a bit disingenuous, no? I think Anne’s comment is interesting because she’s noted the 20 empty shops, which exist despite ample car parking. Also, she notes the lack of development by the private market – similarly, in my area, it is the Housing New Zealand (and in Unitec) the Kiwibuild developments that are going ahead – the private ones seem to be on hold or have disappeared, or the concept is too new to know. Perhaps what Takapuna really needed was for all the public open space, ie all the Council carparks, to be turned into Housing New Zealand apartment buildings? Access by bus to Takapuna is pretty marginal. It is not bad per se, but it is also not what you’d expect for a so-called metropolitan centre. Basically it is reachable by frequent services from only one direction, north. Coming in from the west is slow and infrequent. I noticed from Shan’s post that Birkdale is further away from Takapuna than Mount Eden (in terms of PT travel time). Heidi and KLK what people don’t seem to understand is that there is a whole lot of large scale apartment blocks and new developments happening in the residential streets surrounding the heart of Takapuna. There will be no housing shortage but I don’t expect these will be affordable house either. Under the Untiary Plan there is no requirement for any parking with the new builds. The residents are going to need a large open space to go to for fresh air, socialising, recreation etc such as we see in other big cities – New York’s Central Park. It was not the council who bought the Takapuna Car Park when it came on the market decades ago, but rather it was local families who had businesses in Takapuna who paid for the car park entirely by an arrangement where they also paid the interest. So in a sense the carpark land IS a public space, and under the circumstances many people with vision for the future of this area would like to see the land keep for public use to support the culture, history and community needs of the residents of Takapuna. It is a pity that some people can’t see the real value of the flat-open space. When it’s gone you can never get it back. Can you tell us more, Ann? I don’t know the history of the carpark. Are you suggesting this is a situation where the land was paid for by others and put in council’s name for a kind of safekeeping? Wasn’t there something like that going on with some of the golf courses? My other question, Ann, is about the private development. Am I right in thinking that you’re describing development happening, just not in the shopping area itself; rather, it’s happening in the streets surrounding the shopping area. What do you think is creating this situation? A space for people to pay to store their private property is not a public space. Having it free of development – fine. But if you are serious, you’d be pushing for it to be grassed, some trees, a paved area for markets, a childrens playground. But you are not. What you are advocating is the retention of paid parking for some potential alternative use in future. We are not fooled. And subsidised parking, at that. Ann – There some apartments going up yes, this will not even put a dent in the shortfall of housing supply Takapuna, North Shore, Auckland or New Zealand is suffering. When you talk about comparing New York to Auckland I think that is a bit far fetched. The apartments you talk of back onto Auburn Reserve, another fronts onto the whole of Lake Pupuke. There is a MASSIVE beach and reserver not far away, certainly closer than most NYC apartments are to Central Park. There are quite a few more parks and reserve close by..
How much Public Space do you want???? Last time I checked, I never went for a picnic on Anzac Street car park, lets stop calling it public space! What you need for socializing is a street which is not overly dominated by cars. Or maybe a playground or a little neighbourhood park nearby. You don’t need a huge square for that.